I stand when I see Devin Kineally walking toward me, dressed as usual in her lawyer-gray suit, her high heels clicking against the tiled floor. I take a big breath and pick up my small bag filled with my few possessions. “Yes, I’m ready,” I answer with more confidence than I feel. I’m going to live in a place I’ve never been before with people I’ve never met. I have no money, no job, no friends and my family has disowned me, but I’m ready. I have to be. Devin reaches for my hand, squeezes it gently and looks me directly in the eyes. “It’s going to be okay, you know?” I swallow hard and nod. For the first time, since I was sentenced to ten years in Cravenville, I feel tears burning behind my eyes. “I’m not saying it will be easy,” Devin says, reaching up and wrapping an arm around my shoulders. I tower over her. She is petite, soft-spoken, but tough as nails, one of the many things I love about Devin. She has always said she was going to do her best for me and she has. She made it clear all along that even though my mom and dad pay the bills, I’m her client. She’s the only person who seems to be able to put my parents in their place. During our second meeting with Devin (the first being when I was in the hospital), the four of us sat around a table in a small conference room at the county jail. My mother tried to take over. She couldn’t accept my arrest, thought it was all some huge mistake, wanted me to go to trial, plead not guilty, fight the charges. Clear the Glenn family name. “It couldn’t have happened the way they said it did.” My mother’s coldness matched Devin’s. “We need to make this right. Allison is going to come home, graduate and go to college.” Her perfectly made-up face trembled with anger and her hands shook. I shrank in my seat and expected Devin to do the same. “Richard,” my mother said in that unruffled, irritating way she has. My father slowly lowered his hand, his barrel chest rising and falling rapidly. My father lowered his face into his hands and started crying. My mother looked down into her lap, frowning with embarrassment. When I stood in front of the judge—a man who looked exactly like my physics teacher—even though Devin prepared me for the hearing, told me what to expect, the only words I heard were ten years. To me that sounded like a lifetime. I would miss my senior year of high school, miss the volleyball, basketball, swimming and soccer seasons. I would lose my scholarship to the University of Iowa, would never be a lawyer. I remember looking over my shoulder at my parents, tears pouring down my face. My sister hadn’t come to the hearing. “Mom, please,” I whimpered as the bailiff began to lead me away. She stared straight ahead, no emotion on her face. My father’s eyes were closed tightly. He was taking big breaths, struggling for composure. They couldn’t even look at me. I would be twenty-seven years old before I was free again. At the time, I wondered if they would miss me or miss the girl they wanted me to be. Because my case initially began in juvenile court, my name couldn’t be released to the press. The same day it was waived into adult court, there was massive flash flooding just to the south of Linden Falls. Hundreds of homes and businesses lost. Four dead. Due to my father’s connections and a busy news day, my name never hit the papers. Needless to say, my parents were ecstatic that the good Glenn name wasn’t completely tarnished. I follow Devin as she leads me to her car, and for the first time in five years I feel the full weight of a sun that isn’t blocked by a barbwire-topped fence. It is the end of August, and the air is heavy and hot. I breathe in deeply and realize jail air doesn’t really smell any different than free air. “What do you want to do first?” Devin asks me. I think carefully before I answer. I don’t know what to feel about leaving Cravenville. I’ve missed being able to drive—I’d had my license for less than a year when I was arrested. Finally, I’ll have some privacy. I’ll be able to go to the bathroom, take a shower, eat without dozens of people looking at me. And even though I have to stay at a halfway house, for all purposes I’ll be free. It’s funny. I’ve been at Cravenville five years and you’d think I’d be clawing at the door, desperate to get out. But it’s not quite like that. I’ve made no friends here, I have no happy memories, but I do have something that I have never, ever had in my life: peace, which is a rare, precious thing. How I can be at peace for what I’ve done? I don’t know, but I am. When I was younger, before I was in prison, my mind never stopped racing. It was constantly go, go, go. My grades were perfect. I was a five-sport athlete: volleyball, basketball, track, swimming and soccer. My friends thought I was pretty, I was popular and I never got in any trouble. But under the surface, beneath my skin, it was like my blood was boiling. I couldn’t sit still, I could never rest. I’d wake up at six every morning to go for a run or lift weights in the school’s weight room, then I’d take a quick shower, eat the granola bar and banana I’d shove into my backpack and go to class all day. After school there’d be practice or a game, then home to eat supper with my parents and Brynn, then three or four hours of homework and studying. Finally, finally, at around midnight, I would try to go to sleep. But nighttime was the worst. I would lie in bed and my mind couldn’t slow down. I couldn’t stop myself from worrying about what my parents thought of me, what others thought of me, about the next test, the next game, college, my future. I had this thing I did to help calm myself at night. I’d lie on my back, tuck the covers around me just so and imagine that I was in a small boat. I would conjure a lake so big that I couldn’t see the shore and the sky would be an overturned bowl above me, black, moonless and full of winking fairy lights for stars. There would be no wind, but my boat would carry me across the smooth, dark waters. The only sound would be the lazy slap of water against the side of the boat. This calmed me somehow and I could close my eyes and rest. Because I was only sixteen when I got to prison, I was separated from the general population until I turned eighteen. After surviving the first terrible weeks, I suddenly realized that I didn’t need my boat anymore and I slept just fine. I feel badly for much of what has happened, especially for what my actions have done to my sister. I’ve tried to apologize, tried to make things right, but it hasn’t been enough. Brynn still won’t have anything to do with me. Brynn was fifteen at the time I was arrested and, well, uncomplicated. Or so I thought. Brynn never got mad, ever. It was like she could store her anger in a little box until it got so full it had nowhere to go and it morphed into sadness. When we were kids, playing with our dolls, I would grab the one with the creamy, unblemished face and the smooth, untangled hair, leaving Brynn with the doll that had a mustache drawn on with a permanent marker, the one with ratty hair that had been cut with dull scissors. Brynn never seemed to mind. I could have swiped the new doll right out of her hands and the expression on her face wouldn’t change. She’d just pick up the sad, broken-looking doll and cradle it in her arms like it was her first choice. I used to be able to get Brynn to do anything for me—take out the garbage, vacuum when it was my turn. Looking back, there were signs, little chinks in Brynn’s easygoing personality that were almost impossible to deduce, but when I watched quietly I saw them. And I chose to ignore them. Brynn stopped pulling out her eyebrows, but she found other ways to punish herself. She gnawed her fingernails to the quick, bit the insides of her cheeks, scratched and picked at sores and scabs until they festered. We are complete opposites. Yin and yang. Where I am tall and solid, Brynn is smaller and delicate. I’m a big sturdy sunflower, always turning my face to the sun, and Brynn is prairie smoke, wispy and indistinct, head down, nodding with the breeze. Though I never told her, I loved her more than anything or anyone else in the world. I took her for granted, assumed she would always be at my beck and call, assumed that she would always look up to me. But I don’t seem to exist to her anymore. I can’t blame her, really. Letter after letter I wrote to Brynn, but she never wrote back to me. That has been the worst thing about prison. Now that I’m free, I can go to Brynn, I can make her see me, make her listen to me. That’s all I want. Ten minutes with her, then everything will be all right again. As we get in the car and drive away from Cravenville, my stomach flips with excitement and fear. I see Devin hesitate. “Maybe we should stop somewhere and get something to eat first, then get you settled in at Gertrude House. After that, you can call your parents,” Devin says. I don’t want to go to the halfway house. I’ll probably be the one convicted of the most heinous crime there—even a heroin-addicted prostitute arrested for armed robbery and murder would get more compassion than I ever will. It makes much more sense for me to stay with my parents, in the home where I grew up, where I have some good memories. Even though a terrible thing happened there, it’s where I should be, at least for now. But I can see the answer on Devin’s face. My parents don’t want to see me, don’t want anything to do with me, don’t want me to come home. Charm, Claire and Allison all serve as Joshua’s mother at some point in the novel. In the end, who is the best mother? Why do you think so? How does each of these characters evolve throughout the story? The women in the story all love Joshua in their own way. What else do they have in common? What are their differences? Describe Charm’s relationship with her mother. How does Charm demonstrate her determination to be different than her mother? What qualities do they share? Olene, the director of the halfway house where Allison resides, tells her to “meet the world with hope in your heart.” What does this quote mean for each of the main characters? What does it mean for your own life? Water is consistently referenced throughout the novel. What is its significance? What message do you think the author is trying to relate to the reader? Many of the characters in this novel have hopes and expectations for their family members that are not met. How do the various characters deal with their disappointment? Are their reactions justified? Do you relate to this in your own life? We see glimpses of Allison and Brynn’s parents through each girl’s eyes. How have their parents shaped each girl? How have their roles in their family defined their relationship? How have your parents shaped you? How does public perception of Allison and Brynn differ from how the sisters view themselves—and each other? How does this change throughout the book? How did your perceptions of Brynn and Allison change as you learned more about each character? It is Christopher that connects Allison to Charm, yet his presence in the story is seen only through the eyes of women in his life. What was your impression of Christopher? Why do you think Allison fell in love with him? 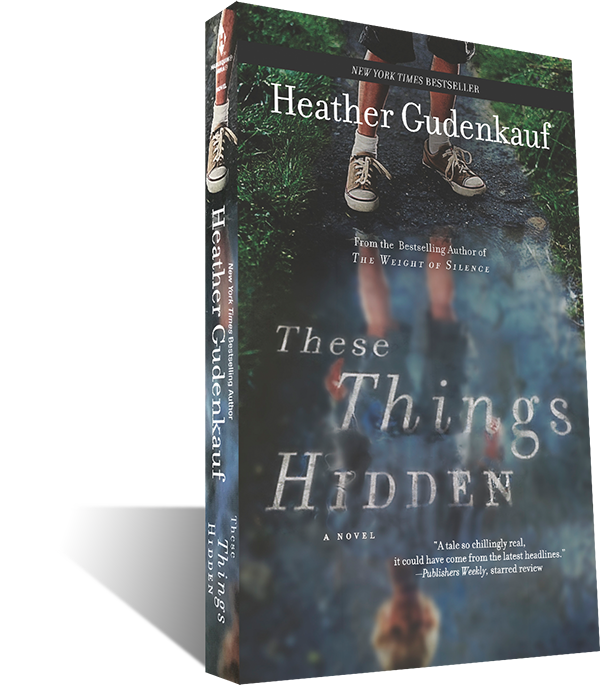 In These Things Hidden , several characters take on the role of a parent—for example, Devin, Olene, Gus—for a child to whom they are not biologically related. What makes a good parent? Has there been anyone in your life who has represented the role of a parent for you? Have you done this for anyone in your life? When Allison is sent to prison for a heinous crime, she leaves behind her reputation as Linden Falls’ golden girl forever. Her parents deny the existence of their once-perfect child. Her former friends exult in her downfall. Her sister, Brynn, faces the whispered rumours every day in the hallways of their small Iowa high school. It’s Brynn – shy, quiet Brynn – who carries the burden of what really happened that night. All she wants is to forget Allison and the past that haunts her. But then Allison is released, and is more determined than ever to speak with her sister. Now their legacy of secrets is focused on one little boy. And if the truth is revealed, the consequences will be unimaginable for the adoptive mother who loves him, the girl who tried to protect him and the two sisters who hold the key to all that is hidden.